There are historical lessons that can help in designing a denuclearization verification regime. How should a country plan a new denuclearization verification regime? Should it concentrate on accounting for fissile material, should it try to “verify” a declaration of the program’s history, or, as some analysts have suggested,1 should it simply redirect the weapons scientists toward peaceful purposes after dismantling the weapons infrastructure and monitor their activity? Enough historical examples have occurred to permit a review of the lessons learned from past denuclearizations and try to draw some conclusions on what has and has not worked. This article highlights the denuclearization of South Africa and Iraq as exemplars at opposite ends of the cooperation spectrum. What is perhaps most surprising is that even with the wide gulf in cooperation provided by each country, there is a consistent theme to both denuclearizations: the necessity to develop a “coherent technical picture” of their nuclear weapons program. To do so requires using inspections to search for the evidence necessary to construct and to verify a coherent understanding of the country’s nuclear weapons and related infrastructure. Contingency plans for inspections with the goal of developing a coherent technical picture can be worked out in advance, but what is actually implemented can only be decided after an agreement has been negotiated. From such an agreement flows the requirements for any declarations the country being denuclearized must submit, as well as the objectives of the inspection regime. Only after the objectives are clear can the right contingency plan for the inspections be implemented. Although all inspection regimes are unique, a case study of them reveals a striking number of similarities in how verification is achieved. To illustrate this, consider South Africa and Iraq, although there are considerably more. The denuclearization of South Africa started out as a fairly standard comprehensive safeguards inspection done when a nation accedes to the nuclear Nonproliferation Treaty (NPT) and signs a comprehensive safeguards agreement with the International Atomic Energy Agency (IAEA).2 The initial declarations the IAEA received October 30, 1991,3 were the standard materials accounting declarations; and although the inspectors had their suspicions4 of why South Africa had such a large quantity of highly enrichment uranium (HEU) in metal form, they kept those suspicions to themselves. Naturally, that changed in March 1993, when President F.W. de Klerk announced that South Africa had produced a limited number of nuclear weapons. All of those had been dismantled, and their HEU had been demilitarized5 and returned to South Africa’s civilian Atomic Energy Commission. If South Africa was a model of cooperation after the president revealed the existence of its nuclear deterrent, Iraq is at the extreme other end of the cooperation scale. Nevertheless, these inspections shared a recognition that verification cannot be absolute either because of practical issues such as humans making mistakes or because the country being inspected has willfully tried to conceal significant pieces of its program. Iraq tried to conceal every aspect of its nuclear weapons program, including denying it had ever had any nuclear material. That was a patently false claim since its Russian-supplied, HEU-fueled research reactor had been under IAEA safeguards for years.17 Over the next seven years, the IAEA patiently tracked down evidence, typically to refute the most significant portions of the most recent version of the Full Final and Complete Declaration issued by Iraq. Arguably the most important discoveries were contained in the so-called Haider House Chicken Farm, which concealed a cache of documents including CDs containing information from the Iraqi group responsible for weaponization.18 This trove of documents might not have ever been found had not Hussein Kamel, Saddam’s son-in-law, defected to the West. That defection prompted Iraq to try to appear proactive by turning the documents over to the IAEA. Central to this methodology is the gathering of as much corroborative or, potentially, contradictory information as possible. Ideally, this information should come from as many different sources as possible, minimizing the chances that the country being denuclearized could create false information meant to divert the inspectors. Declarations of the program’s history are very helpful in this and in other aspects, and negotiations should seek to obtain those if at all possible. Inspection planners should be aware, however, that some information might be too politically sensitive to be released, for example South Africa’s suppliers. Yet, it is possible to verify the dismantlement without such complete declarations. Such an approach would be a radical departure from past denuclearizations and was not applied even to South Africa, where there was a considerable amount of trust. This article takes a different position and advocates a method similar to past successful denuclearizations. The planners, however, should be fully cognizant that a strict fissile material balance is unlikely to be achieved on a politically meaningful timescale. Instead, inspections should be planned from the beginning with a goal of establishing a politically and technically acceptable understanding of the country’s nuclear weapons program. This understanding, or “picture,” needs to be tested by inspections that search out contradictory information to convince the international community there are no significant omissions or discrepancies. Peaceful denuclearization is a complicated process that can only move forward to the extent that the inspecting party and the country being denuclearized can agree on terms for the process. The entire process is controlled by the agreement negotiated between these two parties. This agreement sets objectives for the inspections and their day-to-day function. For instance, the inspecting party clearly might find it advantageous to remove the existing nuclear weapons as soon as possible, while the country being denuclearized might insist on retaining its weapons until adequate security guarantees are put in place. Another important aspect of the agreement is establishing rights and responsibilities of the inspectors during inspections. Contingency plans for a satisfactory inspection regime can be created for both these cases and everything in between, but each inspection contingency plan must start from some assumptions about the final agreement. Importantly, without a document to which inspectors can point, each facility is free to set new and more limiting constraints on the inspectors. This can start a process of “obstructionism creep” where each new constraint acts as a precedent for all future inspections. A second factor that is in some sense just as important is that declarations allow inspectors to discuss topics with experts from the country being denuclearized without too much worry about revealing information that would actually help that country with its bombs, something that might be called “proliferation by inspection.” Sticking strictly to concepts, techniques, and devices mentioned in the declaration can greatly reduce this danger, even if it does not eliminate it completely. Once the agreement has been negotiated, inspectors can develop objectives for the inspection regime. They can start this even before the declarations are received or select the set of objectives from a contingency library. The actual objectives used are dependent on the agreement. For instance, the inspection objectives will clearly be different for a regime that allows open-ended inspections as opposed to one that limits the number of visits or even sets the inspection regime to a single visit to a single site. Placing inspection objectives into the business school framework that other major businesses use may be instructive. The inspection agency’s vision is that they will denuclearize the country; their mission statement is that they will provide the international community with the confidence needed to remove sanctions and accept the country back into the international community; the objectives are the major steps the inspectors will take to accomplish their mission and build the necessary confidence. 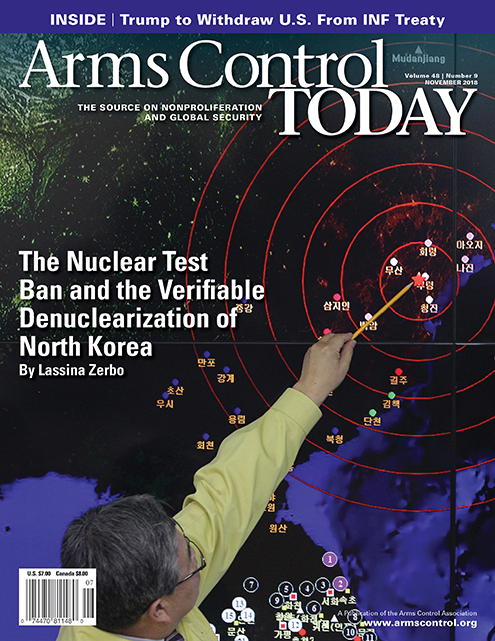 Many people have used the shorthand of “verification” for this step, but that ignores the inspectors’ other objectives, such as reducing the threat the country’s nuclear weapons present by removing them, isolating them in a remotely monitored storage area, or effectively “de-alerting” the weapons, or dismantling their fissile material production capacity. Objectives must be practical given the agreement. One cannot dismantle the country’s fissile material production capacity under an agreement that only allows a single visit to single site because there is no certainty that there are no other such facilities. Under a single-site/single-visit inspection regime, the priorities must be carefully conceptualized and will certainly be different than an open-ended inspection regime. Of course, the vision and mission of the inspection agency also will likely be very different under such an agreement. The inspections performed by the agency are a major part of the inspectors’ tool box. Each inspection should work to contribute to one or more of the objectives. Historical experience shows that a complete understanding of a country’s nuclear weapons program is impossible in practice. There will always be practical problems in establishing the facts about how much fissile material was produced, how many nuclear weapons were built, or even how many centrifuge plants the country has. These problems could arise from benign issues such as the fact that all human beings make mistakes or serious ones such as a wide-scale program of deception. Because of this, inspection agencies should acknowledge these limitations at the start and plan on contributing to the inspection objectives by verifying a technically coherent picture of the weapons program. For instance, if the primary objective is the removal of all nuclear weapons from the country, secondary objectives that contribute to this primary objective include establishing how many weapons were produced. It is too much to hope for that this could be established through accounting for the fissile material produced and where it was shipped on a politically meaningful timescale. Instead, the inspections should look for corroborating information, such as production and shipment records for fissile material and estimates of fissile material used in each weapon from sizes of casting molds. Should an inspection regime concentrate on accounting for fissile material? Fissile material accounting can play an important role in any inspection regime, but there are a number of practical limitations. First, it is likely to take much longer than is politically acceptable. The time necessary for material accounting increases exponentially as the complexity of the weapons program increases. Verifying a complete material balance for South Africa took at least 13 years, until an industrial-scale machine was developed to measure isotopic content of barrels of enrichment tails.24 Further, a country being denuclearized might refuse to reveal its sources of imported materials. If that is consistent with the agreement and it might be for a number of reasons, then establishing a global material balance becomes much more difficult because of the uncertainty created by not being able to verify both sides of the deal. Given these difficulties, inspectors should utilize fissile material production for what it can contribute to the technically coherent picture but not expect it to be the final answer. designs and other declarations. Inspectors should not expect a quantitative constraint arising from fissile materials on a politically meaningful timescale. from weapons assembly facilities. Are they consistent? Do the assembly records use all of the material known to be produced, or are assembly plants missing? Is more material needed to produce the number of weapons than has been shipped to the assembly plant (are there more fissile material production centers)? Starting from scratch will take much longer and could involve much more intrusive inspections than might otherwise be necessary. Of course, the country being inspected could simply deliver detailed briefings on the program, as did South Africa.27 Briefings have the advantage of being interactive, and the inspectors can ask questions and seek clarifications right then. Declarations have the advantage that they can form part of the inspectors’ tool kit and can be used as starting points for discussions at various facilities while avoiding the “proliferation by inspection” trap. It does not address the issue of an unknown weapons infrastructure, and it places the inspecting agency in a similar situation to what the IAEA faced with Iraq’s nuclear weapons program before Operation Desert Storm.29 In this case, working day to day with the “redirected” weapons scientists, as has been suggested,30 should be avoided at all costs. Redirecting scientists after the country’s nuclear weapons program has been dismantled is a key component of preventing it from being reconstituted, but every day the foreign scientists collaborate with the “redirected” scientists without verifying the absence of any covert infrastructure is a day when the country being denuclearized has its cooperation endorsed without evidence. Practical difficulties will almost certainly prevent any inspection from gaining complete certainty that a country has denuclearized. In the end, it will be a judgement call—both technical and political—as to how much corroborative evidence is necessary. The chances of success can be maximized by accepting these limitations at the very beginning and planning for them. This article has suggested a workflow for that planning process that emphasizes using as much information about the procedures in conjunction with material balance. Formulating the agreement with the country being denuclearized, specifying the required information from the declarations, designing the objectives to be accomplished during inspections, and executing those inspections should all be oriented toward constructing a technically coherent picture of the weapons program. That picture can be used to seek evidence supporting it and contradicting it. If the contradictions are not significant while the major outlines of the program are supported by the evidence, then the completeness of the denuclearization can be approached in an objective fashion. Not only will this workflow result in a systematic approach to verification, it will also involve stakeholders throughout the government in the discussion necessary to making the technical and political decisions about how much verification will be necessary. 1. Siegfried S. Hecker, Robert L. Carlin, and Elliot A. Serbin, “A Technically-Informed Roadmap for North Korea’s Denuclearization,” Center for International Security and Cooperation, May 28, 2018, https://fsi-live.s3.us-west-1.amazonaws.com/s3fs-public/hecker_carlin-serbin_denuc_rlc.pdf. 2. Adolf von Baeckman, Garry Dillon, and Demetrius Perricos, “Nuclear Verification in South Africa,” IAEA Bulletin, Vol. 37, No. 1 (1995): 42–48; International Atomic Energy Agency (IAEA), “Agreement of 16 September 1991 Between the Government of the Republic of South Africa and the International Atomic Energy Agency for the Application of Safeguards in Connection With the Treaty on the Non-Proliferation of Nuclear Weapons,” INFCIRC/394, October 1991. 3. David Albright and Andrea Stricker, Revisiting South Africa’s Nuclear Weapons Program: Its History, Dismantlement, and Lessons for Today (North Charleston, SC: CreateSpace Independent Publishing Platform, 2016). 4. Von Baeckman, Dillon, and Perricos, “Nuclear Verification in South Africa,” p. 48. 5. “Demilitarized” means that various highly enriched uranium components in South Africa’s gun-type weapon had been reshaped into very different configurations, partially concealing their use in nuclear weapons. Albright and Stricker, Revisiting South Africa’s Nuclear Weapons Program, p. 197. 6. Garry Dillon and Demetrius Perricos, “IAEA 1991-1995 Safeguards Criteria: Experience Gained in the Verification of the Completeness of the Inventory of South Africa’s Nuclear Installations and Material,” in International Nuclear Safeguards 1994: Vision for the Future (Vienna: IAEA, 1994), pp. 231–241. 8. These were the Building 5000 complex. The “demonstration device” was re-engineered with increased environmental production and safety features from a design built by South Africa’s Atomic Energy Commission (AEC). Albright and Stricker, Revisiting South Africa’s Nuclear Weapons Program, p. 101. 9. The so-called Armscor/Circle facility. 10. Albright and Stricker, Revisiting South Africa’s Nuclear Weapons Program, p. 239. 13. The South African AEC insisted on keeping secret the names of its suppliers and did not originally provide shipping records to the IAEA. 14. Albright and Stricker, Revisiting South Africa’s Nuclear Weapons Program. 15. IAEA General Conference, “The Denuclearization of Africa: Report by the Director General,” GC(XXXVII)/1075, September 9, 1993; UN Security Council, S/1997/779, October 8, 1997. 16. B. Rollen et al., “Validation of IQ3 Measurements for High-Density Low-Enriched-Uranium Waste Drums at Pelindaba,” in Proceedings of the 7th International Conference on Facility Operations-Safeguards Interface, 2004. 17. Garry Dillon and Jacques Baute, “An Overview of the IAEA Action Team Activities in Iraq,” n.d., www.iaea.org/inis/collection/NCLCollectionStore/_Public/33/034/33034358.pdf. 18. UN Security Council, S/1997/779, October 8, 1997. 20. Mark Hosenball, “Held: Iraq’s Scientist,” Newsweek, June 19, 2005; Charles Duelfer, “Comprehensive Report of the Special Advisor to the DCI on Iraq’s WMD,” September 30, 2004, https://www.cia.gov/library/reports/general-reports-1/iraq_wmd_2004/. 21. Hecker, Carlin, and Serbin, “Technically-Informed Roadmap for North Korea’s Denuclearization,” p. 9. 22. Writing declarations is a complicated and difficult process that can initially contain many errors and omissions. For this reason, negotiators from the inspecting country might want to consider offering classes to technical experts from the country being denuclearized. In no case should the inspectors offer to assist in writing the actual declarations. 23. Rod Barton, “The Application of the UNSCOM Experience to International Biological Arms,” Critical Reviews in Microbiology, Vol. 24, No. 3 (January 1, 1998): 219–233. 25. The examples of developing a technically coherent picture are illustrative, not exhaustive, and some of the specifics listed here might be impractical. 26. Dany Shoham, “Iraq’s Biological Warfare Agents: A Comprehensive Analysis,” Critical Reviews in Microbiology, Vol. 26, No. 3 (January 1, 2000): 179–204. 28. Because of the way the negotiations developed, the choice might be between elimination with no verification or no elimination. This then might be the best practical method of denuclearization. 29. Some might point to the IAEA Model Additional Protocol as a sufficient improvement in the inspection regime, and the author agrees. Yet, it is difficult to imagine a country refusing to allow the verification of the dismantlement of its nuclear program and still signing an additional protocol. Geoffrey Forden is a physicist and principal member of the technical staff at the Cooperative Monitoring Center at Sandia National Laboratories. This article describes objective technical results and analysis. Any subjective views or opinions that might be expressed in the paper do not necessarily represent the views of the U.S. Department of Energy or the U.S. government. Sandia National Laboratories is a multimission laboratory managed and operated by National Technology and Engineering Solutions of Sandia, LLC, a wholly owned subsidiary of Honeywell International Inc., for the U.S. Department of Energy’s National Nuclear Security Administration under contract DE-NA0003525. a former UN disarmament chief. Paul Scharre’s book is essential reading for anyone seeking to grasp the monumental changes occurring in the realm of military technology. W.W. Norton, 2018, 436 pp. What are the consequences—military, political, moral, and legal—of giving machines the capacity to select targets and destroy them without direct human guidance? This is the profound question Paul Scharre addresses in his informative and thought-provoking book, Army of None: Autonomous Weapons and the Future of War. Part a primer on the fast-advancing technology of artificial intelligence (AI) and part a soul-searching reflection on its potential application to the conduct of war, Scharre’s book is essential reading for anyone seeking to grasp the monumental changes occurring in the realm of military technology. Some weapons possessing this capacity are already in service. These include, for example, the Aegis Combat System, a complex array of radars, missiles, and computers intended to protect U.S. warships against enemy planes and missiles. When set in the “auto-special” mode, Aegis can automatically launch its missiles against what it has identified as hostile planes or missiles. Human operators have the ability to abort a strike, but otherwise Aegis operates on its own. The Israeli Harpy armed drone is another example. Once launched, it can hover over a designated area, hunt for enemy radars, and strike them on its own volition. Aside from this obvious lure, several other factors are driving the race to develop and deploy autonomous weapons systems. These include the incredible progress being made on AI in the civilian sphere, visions of a future battlespace in which the speed and complexity of action exceeds human comprehension and the ability to respond, and fears of an arms race in AI and autonomous weapons systems, with the United States potentially being left behind. AI is crucial to the further development of autonomous weapons systems as it invests them with a cognitive ability until now only exercised by humans, including the capacity to distinguish potential targets from background clutter and independently choose to eradicate the threat. In a striking shift from current military procurement practices, most of the critical advances in AI and machine learning are coming not from the established arms industry but from startups located in technology centers such as Silicon Valley and Cambridge, Massachusetts. These tech firms are responsible for the image-identification systems and other technologies that make feasible self-driving cars; and once you have built a self-driving car, it is not a great leap to make a self-driving, self-firing tank or plane. Needless to say, this has military planners almost giddy imagining all the possible battlefield applications. Pentagon officials are especially keen to explore these potentialities because they envision a future battlespace characterized by extremely fast-paced, intense combat among well-equipped adversaries. This reflects the onward march of technology and the assessment, spelled out in the December 2017 “National Security Strategy of the United States of America,” that we have entered a new phase of history in which geopolitical competition with China and Russia has replaced terrorism as the principal threat to U.S. security. Any future military engagement with one or both of these countries would, it is widely assumed, entail the simultaneous use of countless planes, missiles, tanks, and ships in a highly contested battle zone. In such encounters, human operators may not be able to keep track of and destroy all potential targets within their portion of the battlespace, and so the temptation to let machines assume those critical tasks can only grow. This leads to the next key factor, a fear of an arms race in AI, with U.S. adversaries conceivably jumping ahead in the burgeoning contest to deploy autonomous weapons systems on the battlefield. As Scharre ruefully indicates, the United States is not the only country that possesses the tech centers capable of generating AI advances and of applying them to military use. In fact, other countries, including China, Russia, the United Kingdom, and Israel, are moving swiftly in this direction. As Scharre makes very clear, the deployment and use of fully autonomous weapons systems on the battlefield will entail a revolutionary transformation in the conduct of warfare, with machines conceivably being granted the ability to decide on their own to take human life. There is, of course, some uncertainty as to how much autonomy future weapons will be granted and whether they will ever be fully “untethered” from human supervision. As Scharre demonstrates, however, the technology to empower killing machines with an ability to operate independently is emerging rapidly, and the use of this technology in warfare appears almost inevitable. This sparks important moral and legal questions: moral in the sense that investing machines with the capacity to take a human life potentially absolves their operators’ responsibility for any injustices that might occur and legal in that the use of lethal autonomous weapons could violate international humanitarian law. In addressing the moral dimensions, Scharre draws on his extensive experience as a U.S. Army Ranger in Iraq and Afghanistan. In one of his most arresting passages, he describes an incident in which he and some fellow soldiers, while positioned atop a mountain ridge on the Afghan-Pakistani border, observed a girl perhaps five or six years old, herding goats nearby. In the stillness of the mountain air, they could hear her talking on a radio—a clear indication she was scouting their position for a Taliban force hiding nearby. Under the rules of war, Scharre explains, the young girl was an enemy combatant, putting his unit at risk, and so could have been shot. Yet, he chose not to, acting out of an innate moral impulse. “My fellow soldiers and I knew killing her would be morally wrong. We didn’t even discuss it.” Could machines ever be trained to make this distinction? Scharre is highly doubtful. War is an ugly, brutal activity; and humans, despite numerous efforts over the centuries, have failed to prevent its regular recurrence. Yet, humans have sought to impose some limits on killing, believing that basic morality or religious principle forbids bloodletting of certain kinds, such as the killing of unarmed civilians or wounded enemy soldiers. Efforts have been made to formalize these natural inhibitions in law or religious scripture, but it has often proved difficult to inscribe precisely what is deemed acceptable and what is not. Yet, as Scharre notes, there are situations in which it is self-evident to humans that certain behaviors should not be allowed to occur. However smart the machines are made, he argues, they are never likely to acquire the capacity to make such judgments in the heat of battle and so require some human oversight. Scharre says it is theoretically possible to design machines smart enough to comply with international humanitarian law, but acknowledges that the risk of misjudgment will always be present when machines make life-and-death decisions, hence invalidating their use without human supervision. Most of Scharre’s discussion concerns the potential use of lethal autonomous weapons systems on the conventional battlefield, with robot tanks and planes fighting alongside human-occupied combat systems. His principal concern in these settings is that the robots will behave like rogue soldiers, failing to distinguish between civilians and combatants in heavily contested urban battlegrounds or even firing on friendly forces, mistaking them for the enemy. Scharre is also aware of the danger that greater autonomy will further boost the speed of future engagements and reduce human oversight of the fighting, possibly increasing the danger of unintended escalation, including nuclear escalation. Two aspects of increased autonomy appear to have particular relevance for nuclear escalation and arms control: the temptation to endow machines with greater authority to make launch decisions of intercontinental ballistic missiles (ICBMs) or other nuclear munitions in the event of a major great-power crisis and the potential use of AI-empowered systems to suss out the location of ballistic missile submarines and mobile ICBM launchers, hence boosting the risk of a first-strike attack in such a situation. As the speed of military engagements accelerates, Scharre writes, it will become ever more difficult for humans to keep track of all the combat systems, enemy and friendly, on the battlefield, increasing the temptation to give machines more control over maneuvering and firing decisions. Highly intelligent machines could help relieve them of this pressure by monitoring all that is occurring and taking action when deemed necessary, in accordance with previously inserted computer protocols, to ensure a successful outcome. Another worry is that dramatic increases in AI-driven image identification will be combined with improved drone technology to create autonomous systems capable of searching for and conceivably destroying ground-based mobile missile launchers and submerged submarines carrying ballistic missiles. Most major nuclear powers rely on mobile missile systems to ensure their ability to retaliate in the event of an enemy first strike, thereby bolstering deterrence of just such an attack. With existing technology, it is almost impossible to monitor the location of an adversary’s ground-based mobile launchers and missile-carrying submarines in real time, making a completely disarming first strike nearly impossible. Some analysts, including Scharre, worry that future AI-powered drones (ships, aircraft, and submersibles) will possess the capacity to achieve such monitoring, making a first strike of this sort theoretically possible. Indeed, Scharre describes several projects now underway, such as the Pentagon’s Sea Hunter vessel, that could lead in this direction. Even if such systems do not prove entirely reliable, their future deployment could lead national leaders to fear an enemy first strike in a crisis and so launch their own weapons before they can be destroyed. Alternatively, the other party, fearing precisely such a response, may fire first to avoid such an outcome. As Scharre laments, policymakers have devoted far too little attention to these potentially escalatory consequences of fielding increasingly capable autonomous weapons systems. Although the record of attempts to control emerging technologies through international agreements is decidedly mixed, he argues that some constraints are essential to ensure continued human supervision of critical battlefield decisions. Humans, he concludes, act as an essential “fail-safe” to prevent catastrophic outcomes. No one who reads Army of None carefully can come away without concluding that the global battlespace is being transformed in multiple ways by the introduction of AI-powered autonomous weapons systems and that the pace of transformation is bound to increase as these machines become ever more capable. As Scharre persuasively demonstrates in this important new book, progress in autonomous weaponry is occurring much faster than attempts to understand or regulate such devices. Unless there is a concerted effort to grapple with the potential impacts of these new technologies and develop appropriate safeguards, we could face a future in which machines make momentous decisions we come to regret. 1. For a comprehensive summary of these arguments, see Human Rights Watch, Making the Case: The Dangers of Killer Robots and the Need for a Preemptive Ban, December 9, 2016, https://www.hrw.org/report/2016/12/09/making-case/dangers-killer-robots-and-need-preemptive-ban. Michael Klare is a professor emeritus of peace and world security studies at Hampshire College and senior visiting fellow at the Arms Control Association. U.S. President Bill Clinton and Russian President Boris Yeltsin, during their March 1997 summit in Helsinki, discussed over dinner their common burden of having an always-close-by nuclear “football,” a briefcase containing documents and communications gear necessary to initiate nuclear war. As described in a recently declassified U.S. memorandum, the two leaders compared experiences of having briefly surrendered nuclear authority while undergoing medical operations. Clinton talked about the U.S. procedures for passing power temporarily to the vice president. Yeltsin recalls that, at the time of his 1996 heart surgery, he briefly passed authority, and his nuclear briefcase, to Prime Minister Viktor Chernomyrdin. President Yeltsin: Chernomyrdin did not have very long to play with these toys. The President: Well let's hope none of us ever have to play too much with those toys. President Yeltsin: I have actually taken part in an exercise with the Russian “football” at one point that involved launching a warhead onto the Kamchatka Peninsula. President Yeltsin: What if we were to give up having to have our finger next to the button all the time? We have plenty of other ways of keeping in touch with each other. They always know where to find us, so perhaps we could agree that it is not necessary for us to carry the chemodanchik (Russian term for their equivalent of the “football”). The President: Well, I'll have to think about this. All we carry, of course, are the codes and the secure phone. President Yeltsin: Yes, you and I are the only leaders who have to do this. Talbott: Mr. President, given the responsibilities of your office and President Yeltsin's, it makes more sense for the two of you to have these devices with you at all times rather than to have the function assigned to a computer somewhere or to anyone else. The President: Well, if we do the right thing in the next four years, maybe we won't have to think as much about this problem. This issue of nuclear reduction is very important. If we were able to get to the place where our successors could go even lower than 2,000 nuclear weapons on all sides, then we would have to come to some understanding with the Chinese and the Indians and others, because it's absolutely crazy for countries as poor as those to have to waste so much money on nuclear weapons. Trump signs defense-related spending bills. But nuclear-armed states and their allies remain steadfastly opposed. The Treaty on the Prohibition of Nuclear Weapons gained seven additional signatories and four additional states-parties at a second signing ceremony Sept. 26, the United Nations-declared International Day for the Total Elimination of Nuclear Weapons. Two countries signed the treaty shortly after the ceremony, bringing the total number of states-parties to 19 and signatories to 69 as of Nov. 1. The treaty enters into force after ratification by 50 states. The treaty, adopted in July 2017 and opened for signature two months later, includes prohibitions on the use, production, stockpiling, and transfer of nuclear weapons for all states-parties. It also stipulates that states-parties must provide assistance to victims of nuclear weapons use and environmental remediation for land affected by nuclear weapons. Angola, Antigua and Barbuda, Benin, Brunei, Guinea-Bissau, Myanmar, Saint Lucia, Seychelles, and Timor-Leste signed the treaty at the signing ceremony; Gambia, Samoa, San Marino, and Vanuatu ratified it. Twenty-one of the 69 treaty signatories are from the African continent, 13 from Asia, 13 from North America, 10 from South America, seven from Oceania, and five from Europe, including the Holy See. The Oceanic region has the most states-parties (five), while Africa has the fewest, with only one. The pace of signatures and ratifications is similar to the nuclear Nonproliferation Treaty, which had 71 signatories and 14 states-parties a year after it opened for signature. Close to 50 non-nuclear-armed countries expressed support for the treaty during the initial week of the UN General Assembly First Committee meeting. However, nuclear-armed countries and many of their allies scorn the treaty, as reflected in several of their statements and a strong joint denunciation by China, France, Russia, the UK and the United States. Proponents of the treaty “do not offer solutions to these security challenges, or even acknowledge that they play a role in states’ thinking about deterrence and disarmament…. Instead, they seem to believe that we can skip to the final step of this process—simply banning nuclear weapons—and trust that the details will work themselves out,” Andrea Thompson, U.S. undersecretary of state for arms control and international security, told the committee on Oct. 10. Several states have recently published reports on their investigations into national consequences for treaty accession. Sweden, which launched such an inquiry a year ago, has said that it would publish the results by Oct. 31. The Swiss government decided in August against signing, although there is continuing action in the legislature favoring signature. (See ACT, May 2018.) Norway, a NATO member covered by the U.S. nuclear umbrella, released its review in early October. Kjølv Egeland, a fellow at the Norwegian Academy of International Law, tweeted on Oct. 9 that the report concludes that Norway signing the treaty is “off the table for now,” given that it would contradict nuclear deterrence policy. Civil society groups, such as the Norwegian Academy of International Law, have issued reports considering the implications of joining the treaty. The Women’s International League for Peace and Freedom in Sweden, an ICAN partner organization, published a compilation of essays urging Swedish ratification and examining the treaty’s relationship to Swedish security arrangements and trade. On Oct. 29, Norwegian People’s Aid, a member of ICAN’s steering committee, released the Nuclear Weapons Ban Monitor, assessing the compliance of 197 states with the treaty.